DC Password And Encrypted Data Manager Doc - Initial Login - Douglas Computing, Inc. Type in a name for your username, then also type in a password phrase, and then retype it. Please note, your username may include spaces (e.g. P. Douglas). Type in a password or passphrase that is 12 or more characters long. E.g. ILuv2R3adAb0utSpac3Al13ns. (See here for more information about creating strong passwords and passphrases.) Please note: IT IS CRUCIAL THAT YOU REMEMBER YOUR PASSPHRASE for the DC Password And Encrypted Data Manager. IF YOU ARE UNABLE TO REMEMBER YOUR PASSPHRASE, YOU WILL NOT BE ABLE TO ENTER THE APPLICATION AND ACCESS YOUR (ENCRYPTED) DATA AGAIN. If there is a chance that you could forget your passphrase, consider writing it down on paper, and hiding the paper securely in a place where you can remember it. 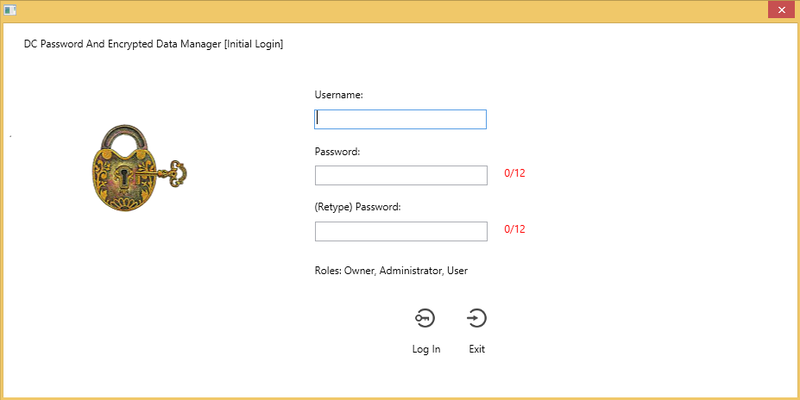 After you have entered your username and passphrase, click on the Log In button to enter the application.